Condition: Hardcover. Minor foxing. Binding tight, uncut pages. With 56 beautiful illustrations. 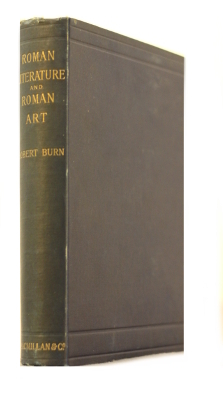 These essays are an attempt to show the cognate character of Roman Literature and Roman Art by pointing out the National tendencies of the Romans from which they both sprang. I hope that in these short studies a new interest will be given to the study of Roman History which may be carried on further by some abler hand than mine. They have been a solace and occupation to me in many hours of sickness and enforced leisure. The vast extent of the ancient Roman Empire has naturally led me to compare it to the modern British Empire; the same mistakes have been made and are being made by the two nations in both Literature and Art. Instances of this will doubtless occur to every thoughtful man.